Reviews, trends and tips covering all things flexible packaging to protect your products and your bottom line. One of the hottest new trends to hit the packaging world is the introduction of opaque packaging films, particularly for e-commerce businesses that ship a diverse array of items to consumers all over the world. Opaque packaging films are new films that eliminate the need for traditional corrugated boxes and fillers. With this innovation, the machinery wraps items as they are, cutting out bulky packages. And because the film is opaque, what’s inside remains private. This new type of film cuts down on waste, reduces costs, maintains privacy, takes up less space, improves overall efficiency, and upgrades the consumer experience. In an increasingly connected world, there are few areas that the internet hasn’t gotten its megabytes into. The rise of data sharing is only on track to continue, with the Internet of Things (IoT) growing in scope and significance. In keeping with this rising trend, smart packaging (also known as intelligent packaging) is becoming the new standard in the manufacturing space. Think of it as an upgrade — like watches and televisions, adding “smart” elements to packaging can vastly improve the consumer’s (and manufacturer’s) experience, with infinite opportunities to take advantage of the technology. Read on to learn all about the possibilities of smart packaging, and how it’s being utilized by manufacturers. We all want to save the most we can with any projects we take on. 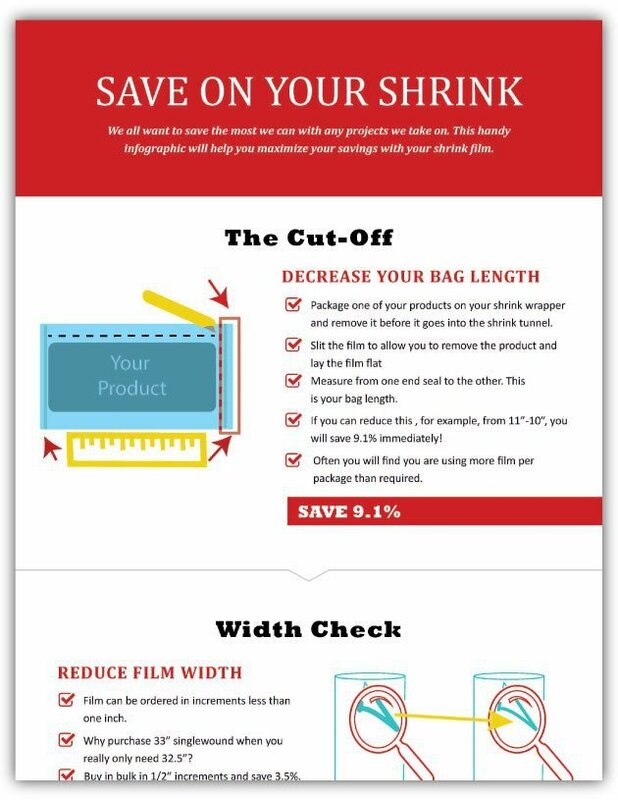 This handy infographic will help you maximize your savings with your shrink film. Get it for free when you subscribe to our blog. You’ve probably heard the term Internet of Things (IoT), but what does this ubiquitous industry buzzword refer to, exactly? The IoT is the interconnectedness of everyday objects and machinery to the internet through computerization (microchips, sensors, etc. ), enabling inanimate items to exchange data and communicate with other connected objects. Industry insiders are predicting that the IoT could change manufacturing as we know it by tracking and measuring every previously unquantified element of operations. Read on for everything you need to know about the IoT and packaging, including what’s trending now, how companies are innovating, and a predictive look forward. 2019 is fast approaching, which means it’s a good time to think about the state of the e-commerce packaging industry. By understanding where it’s headed and what trends are on the horizon, you’re in a better position to ensure that your business stays current and competitive. Industrial production and manufacturing as a whole has seen a steady uptick in demand and revenue forecasts since the start of 2015. This steady increase has created many growth opportunities for manufacturing and packaging plants alike. This growth is the result of companies considering new lines of products or ramping up production of existing lines. Either way, expansion of facilities is often the best way – or the only way – to achieve business objectives and keep up with demand. Advances in technology are often the driving forces behind businesses’ improved efficiencies and competitive advantages. In nearly every industry in the world, technological innovation separates businesses from their competitors and ultimately pushes the entire industry forward – forcing all companies to adapt or risk irrelevance.